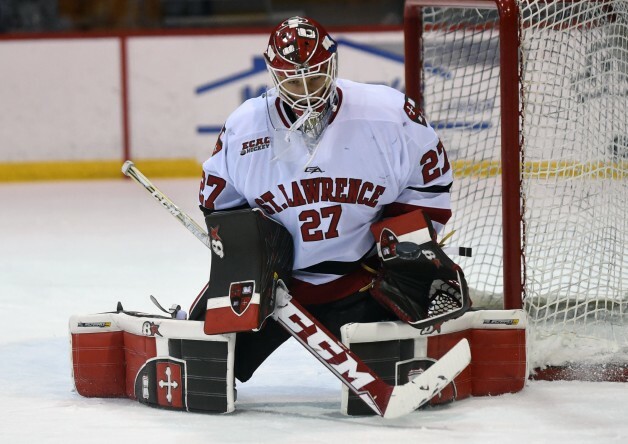 Entering the 2014-15 season, few expected St. Lawrence University to make much noise in the loaded ECAC. Picked in the preseason to finish 11th, the youthful Saints instead won 20 games, ended up second in the ECAC and reached the conference tournament semifinals. That has carried over to this season where St. Lawrence has flirted with top-20 rankings while further establishing itself as a contender in a conference that at times has boasted four top-10 teams. A big reason for the Saints’ ascent has been the play of sophomore goaltender Kyle Hayton. It didn’t stay that way for long. Hayton was well enough known by the end of the season to be selected the conference’s rookie of the year. He started all but one of the Saints’ 37 games, went 20-13-3 and set school records with a 1.95 goals-against average, a .937 save percentage and five shutouts. It wouldn’t be unreasonable to expect some drop-off in Hayton’s play in Year 2 because foes have plenty of video of him to study, but that hasn’t been the case. He ended February with a 16-11-3 record, a 2.09 GAA and a .933 save percentage and was also named a finalist for the 2016 Mike Richter Award as the top goalie in all of NCAA Division I.
Hayton, who played youth hockey for the CC Jr. Tigers, the Colorado Thunderbirds and the Colorado Hockey Club before going to Shattuck-St. Mary’s Prep School in Minnesota, quickly entrenched himself as a leader at St. Lawrence. Hayton deflects the praise, saying only that facing 40 shots per game helped him stay sharp. The benefits worked both ways, Thunderbirds goalie coach Cam Clemenson said. Hayton also gives credit to the strong foundation he built in Colorado. Hayton, who is pursuing a double major in business and economics, said academics were a big reason he chose St. Lawrence. Hayton and St. Lawrence have been an excellent match, and one gets the impression there are several more chapters yet to be written. “He’s a kid who has a lot of intangibles that will build our program,” Carvel said.